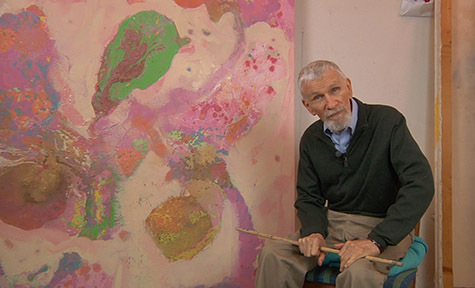 Gary Eyster was an innovative, process based abstract expressionist artist with studios in Wilmington, North Carolina and York, Pennsylvania. Working until his death in July 2013, Gary never ceased exploring ways to express and fine tune his artistic vision. Gary Eyster's training in art spanned the 1950s and 1960s with traditional art education at schools in Philadelphia, Richmond, London, Paris, and Wetzler, Germany. Striving to break away from habits and routines that sometimes stifle creativity, Gary searched for novel ways to introduce spontaneity and randomness into his artistic process. This led him to paint with such unusual objects as plungers, squeegees, wide mouth jars and squeeze bottles. Gary even created a number of works by applying paint and powdered pigments through layers of water to the canvas below. This unique process also allowed him to pull monotype prints from the surface of the water, creating works that were simultaneously unique and derivative of their larger, canvas progenitors. We hope you enjoy Gary's exciting and innovative works as you explore this site.